This species has an elongated body form with a large, slightly oblique mouth and an upper jaw extending behind the eye. The lower edge of the preoperculum is serrated with a strong spine at its angle; the operculum has a small spine and a serrated flap above the origin of the lateral line. Its scales are ctenoid. In cross-section, the fish is compressed and the dorsal head profile clearly concave. The single dorsal and ventral fins have spines and soft rays; the paired pectoral and pelvic fins have soft rays only, and the caudal fin has soft rays and is truncate and rounded. Barramundi are salt and freshwater sportfish, targeted by many. They have large, silver scales, which may become darker or lighter, depending on their environments. Their bodies can reach up to 1.8 m (6 ft) long, though evidence of them being caught at this size is scarce. The maximum weight is about 60 kg (130 lb). The average length is about 0.6-1.2 m (2-4 ft). 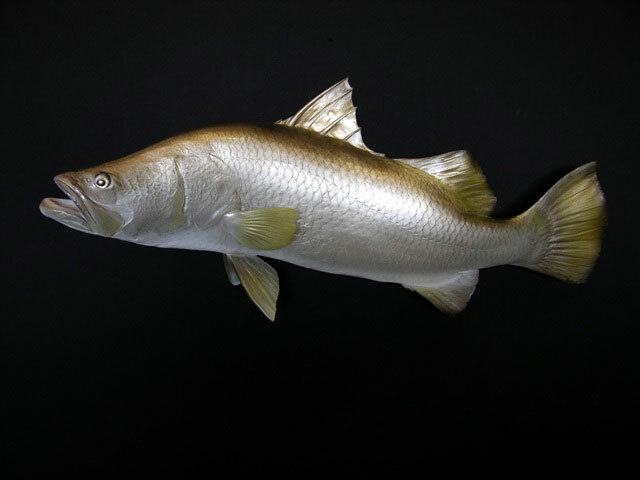 Barramundi are demersal, inhabiting coastal waters, estuaries, lagoons, and rivers; they are found in clear to turbid water, usually within a temperature range of 26−30°C. This species does not undertake extensive migrations within or between river systems, which has presumably influenced the establishment of genetically distinct stocks in Northern Australia.